This hat makes a sweet ornament for your Christmas tree. It works up quickly so you can make several in time for your holiday decorating. You can use any weight yarn or even crochet thread to whip this up. 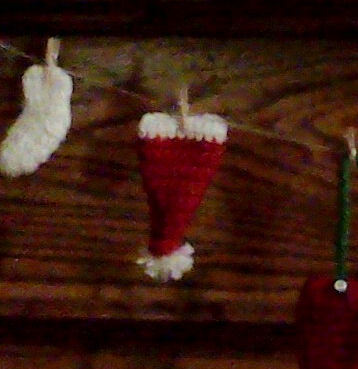 Of course, you can always purchase my Santa’s Clothesline pattern and add a jacket, trousers, and socks, then hang them on a cord in front of the mantel or over a door opening. Tails Try to work all tails (except for the ones to be used for seaming) in as you go by crocheting over them. This will mean fewer tails to weave in later. Row 4 Ch 1, turn, sc in ea sc across. Rows 14-16 Rep row 4. Fasten off. Row 17 Hold red piece so end just fastened off is on your right. Mark this side as the RS. Join white with sl st in first sc, ch 1, sc in same sc, sc in ea sc across. Work in both the red and white ends into piece as you go. Row 18 Ch 1, turn, sc in ea sc across, fasten off leaving a long tail for seaming. Fold hat in half, RS together, matching up white edges and red rows as much as possible. Sew up seam using the long tail from the top of the hat for the red section. Use the white tails to connect the white trim. Weave in all ends and turn hat RS out. Add a small white pom pom at the tip of the hat. This can be a purchased one or a quick one made with your white yarn. Cut a piece of white yarn about 10″ long. Place the yarn between your index and middle finger, letting the ends dangle down. If you don’t place the yarn this way before you continue, it will be a lot harder to get the yarn around the pom pom section that will be wrapped around your first two fingers. Wrap white yarn around the index and middle finger about 10 times. Don’t cut the yarn yet. Take the ends of the yarn you placed between your fingers and wrap them around the yarn that is around your fingers. Tie in a knot to hold the wrapped yarn together. Cut the yarn going to the skein but leave the long ends that you just tied. Carefully cut the wrapped yarn loops then trim the ends to even out your pom pom. Using your yarn needle, thread the long tails into the top of the hat making sure each tail is inserted into a different st. Turn the hat inside out, using the long tails to help do so. Tie the tails into a knot and trim the ends. Turn the hat RS out.